Artefacts from a ship that sank off the Cornish coast in the 18th century will be on show at a country park when £41,000 has been secured. The Metta Catharina sank in 1786 off south east Cornwall. Its cargo, including calf hides and glassware will be on display at Mount Edgcumbe House. For 32 years divers have retrieved the artefacts which will be on show alongside an exhibition in 2013. A lottery grant has provided the money to help fund the project. Items found on the Metta Catharina von Flensburg included Russian calf hides, wine carriers, clay tobacco pipes and shoe buckles, a spokesperson from Plymouth City Council said. Ian Skelton, chairman of the Metta Catharina Trust, said: "It is wonderful news that after 32 years of diving and research, the story of it can be told. "Mount Edgcumbe is a fitting location for the artefacts to be displayed." The total cost of the project will be £60,500 with additional funding coming from the Friends of Mount Edgcumbe, the Metta Catharina Trust and Mount Edgcumbe, the council spokesperson added. 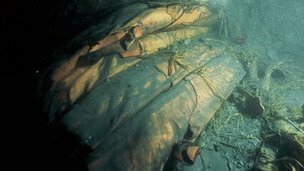 The Metta Catharina lay almost completely buried in deep silt off Mount Edgcumbe and was discovered by divers in 1973.